I received my monthly Paper Pumpkin box, so I made these cards for Cards For A Cause. June’s featured organization is Community Pregnancy Center of Barberton, Ohio. In 2013, I’m doing Inspiration Mondays and Results Thursdays. Every Monday, I’ll post a painting “inspiration” and then on Thursdays, I’ll post how I’m interpreting that inspiration. 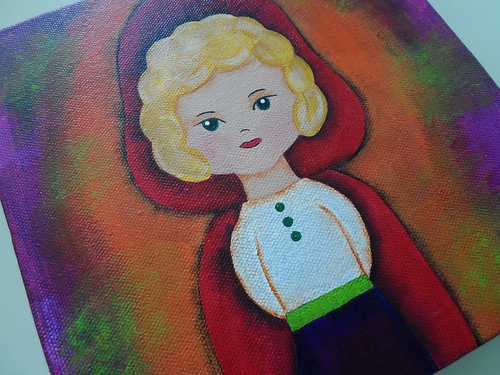 Last week’s inspiration was from my friend, Amy…LITTLE RED RIDING HOOD. Here is the girl I started, using that inspiration. This week’s inspiration comes from The Typist (Georgia’s momma) of Little Dogs On Long Leashes…SCHOOL DAYS. This entry was posted on Monday, June 24th, 2013 at 3:21 am	and is filed under In My Studio, Inspiration. You can follow any responses to this entry through the RSS 2.0 feed. You can leave a response, or trackback from your own site. 12 Responses to " In My Studio – June 24"
Good luck with Little Dogs On Long Leashes. Have a terrific Tuesday. 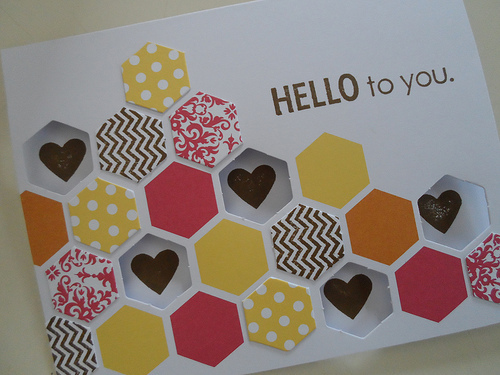 That is a lovely card, I like cards that are not too flowery and sugary like that. Can’t wait to see your Little dogs on long leashes painting. Your Red Riding Hood girl is wonderful, I love how you have painted her cloak kind of in the background. I meant to add curious about next week’s painting. I really like that card! You always make such pretty and clever things! Looks like you’ve been very busy! And very creative. Our Martha strikes again! Am I the only one who sees something a little ominous in your Red Riding Hood? I suppose the tale that inspired the painting is a little dark as well. Or maybe it says more about me than it does your painting! She did turn out a little fierce. Probably knows she’s got a wolf to deal with. how did you make the apertures? a punch? die or was a pre-cut card blank? I think those bundles of craft sent to you are very nice 🙂 Do you come up with your own card designs or do you follow a proposed project from the craft kit? These cards came in a kit and the apertures were pre-cut. When it comes to cards, I most often follow a pattern. I’ll change colors and papers, but that’s about it. It’s funny…I have no problem painting with abandon, but when it comes to papercrafting, I’m not very adventurous.